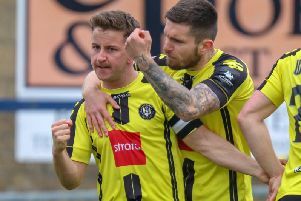 Ripon City manager Steve Donoghue said his side’s drop to the bottom of the West Yorkshire Premier Division won’t have a negative effect on his players. Donoghue’s men have now taken up the unwanted position at the foot of the league after consecutive wins for East End Park put them level with Boroughbridge on nine points. Ripon could do nothing to prevent their fall to the bottom for the first time this season after their game against Field on Saturday was postponed, leaving them stuck on seven points. Despite East End Park leap-frogging his side after their 1-0 win over Brighouse on Saturday, Donoghue is staying positive about his side’s survival chances. He said: “I suppose East End Park winning is not too bad for us. It has dragged Brighouse down and we have got games in hand. We also still need to go to Boroughbridge, East End Park and Brighouse. “We’re still not sure how many teams will go down in terms of teams in our league applying to go into the Northern Counties league but we definitely won’t go down if we finish fourth from bottom. Donoghue is hoping to have more players available for their home clash against Leeds City on Saturday after missing key players in the recent defeats to Robin Hood Athletic and Otley Town. Alistair Hogg endured a humiliating day to forget the last time the two sides met in September as Leeds smashed 12 past his hapless side. Donoghue said: “Leeds City are a good footballing side so it’s important we put in a good performance but I’m hoping it won’t be too difficult to get players out in the next few months. “I should be getting 14 players out every week when you look at the size of the squad we have but it’s been difficult to get in touch with some of the players. “We have got so many home games coming up that it might not even be an issue. Ripon City Reserves’ promotion bid remains on course after a 8-1 win over Barwick Reserves on Saturday.